Click TotemPole-Sept1966 for an article from September 1966, kindly provided by City of St. Catharines Parks, Recreation and Culture Department. There are Centennial totem poles in many Canadian cities (currently many are the subject of conservation concerns) and presumably this practice was part of federal policy for Canada’s Centennial commemoration, through the Centennial Commission. I am still seeking information, especially on the totem pole commissions. Library and Archives Canada was very diligent and helpful with my query and I intend to go Ottawa to follow it up. Here are other links about 1967 Centennial Celebrations. *Click here for information on the U’mista Cultural Society – Alert Bay Potlatch Collection. Click here to hear an excerpt from, A Strict Law Bids Us Dance (1975), and the words of a Kwagu’l Chief’s (O’waxalagalis) speech from October 7, 1886 is Tsaxis (Fort Rupert). I have a crystal-clear memory of being in a classroom at Lady Churchill Senior Public School on Glenridge Ave. in St. Catharines and being taught about how potlatches were outlawed and what a crazy practice they were, because Indians gave away their wealth. It was Centennial Year, when I did my Centennial project on Emily Carr. I don’t remember anything about the totem pole that was erected in the park created for the Centennial, or learning about the artist Douglas Cranmer. It wasn’t until well into middle-age that I learned how Canadian Indian Act laws outlawed dancing. How strange that this culture outlawed generosity and dancing. Please take a look at the Traditional Territory page. Click here for a link to writings by Alun Hughes, but that link does not include his article on Richard Pierpoint – try this one. Not far from the totem pole, at the bottom of the embankment below Gale Crescent, is an area of “ruins”, mostly cut-up architectural columns. These are often thought to be from the old Carnegie Library at the corner of Church and James Streets, which was replaced with the Central Branch just up the street at 54 Church St.; like so many Canadian public libraries, it was a Centennial project. However, the Carnegie Library had smooth columns. 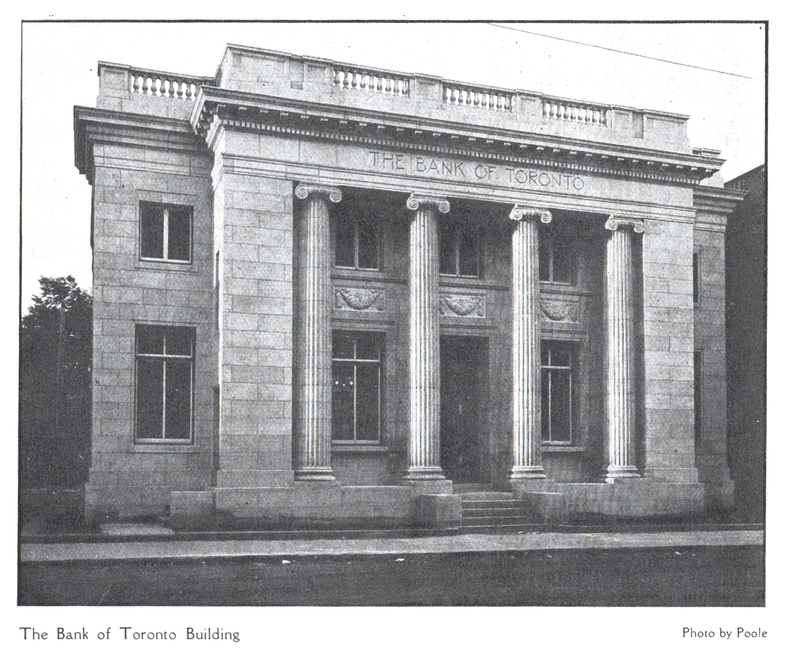 Local historian Dennis Gannon, is convinced the columns in Centennial Gardens come from the Bank of Toronto which stood on Queen St. near King where the TD Bank is today. Presumably the wrecking company simply dumped the pieces on the embankment, which speaks to the site’s rich history of cycles of industry, abandonment and reclamation.